How to choose the best men's Driving Shoes and where to buy outstanding quality Moccasins. The pro’s & con’s of wearing moccasins, as well as essential style tips. Ready for an in-depth review of everything you need to know about men's driving moccasins? 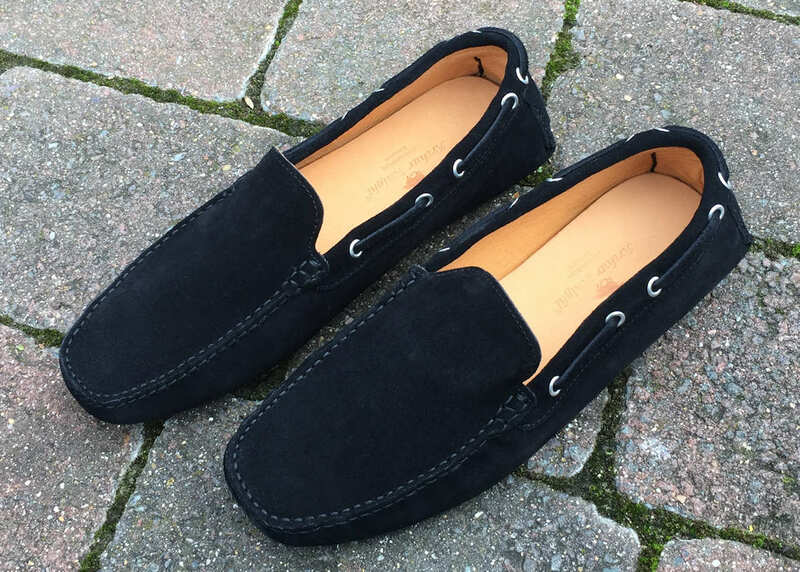 Our resident shoe expert Mr. Anthony Gibbs looks at the origin of driving shoes, the pro’s & con’s of wearing them, as well as style tips and where to buy the best step in moccasin loafers. Let’s start with the basics… Driving shoes are all ‘moccasin construction’. But what exactly is a moccasin? The first practical original moccasins were worn by native American Indian tribes. The construction was simple, using readily available buffalo skin leathers and natural fibres or thin leather strips to stitch the parts together. The moccasin consisted of a large piece of leather cut around the shape of a foot, which was then joined to a cut out oval shaped 'vamp' or ‘apron’ of leather. These were then hand stitched to the base leather to cover the toes and forepart of the foot. The back part of the foot had two short cuts at the back stitched together to fit around the heel, thus, the foot was completely encased. Often moccasins were decorated with beads or feathers, or decorative whip stitching to create an individual personalised pair of moccasins. However, the basic principle of a moccasin construction means the foot has been completely encased by soft leather. The one disadvantage of this simple moccasin construction was the soft leather quickly wore out. The next evolution from this basic moccasin (made possible by the introduction of mechanised industrial footwear production), was the application of a thicker leather sole and heel. Factory operatives apply these to the base of the moccasin and stitch them using a Blake machine to give a considerably more robust construction. This is the modern construction still used today. Many variants have evolved from this method of construction such as the Classical American Penny Loafer, the Fringe and Tassel Loafer. The next generation of moccasins incorporated rubber soles, both rugged with a “commando design” like the robust Timberland™ outdoor moccasin. 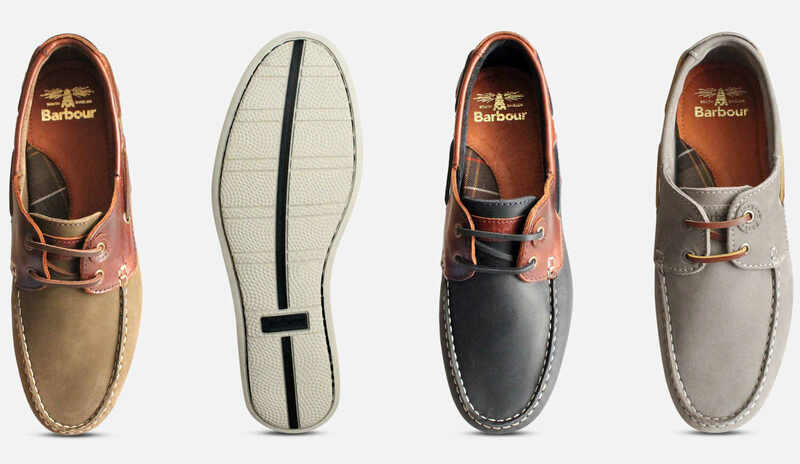 Lighter soles with zigzag patterns are also used for boat shoes, offering ample grip and non-slip properties. These were the forerunners to the modern men's driving moccasins. 1. The full rubber sole with a stitched side wall, known in the shoe trade as a ‘Cup-sole’. This incorporates an integral heel clip going up the back of the moccasin. 2. The summery lighter weight ‘rubber dotted sole’, which has round rubber pads protruding through the leather moccasins. Our Arthur Knight men’s driving moccasins feature the rubber dotted sole construction with suede leathers in many bright attractive colours and all with a neutral coloured soft calf leather lining. Driving shoes are becoming increasingly popular with ladies too. Since Hilary Clinton was photographed wearing the famous Tod’s™ in the late 1990’s, driving shoes for women have become the latest sensation. At Arthur Knight, we also have a superb range of ladies driving shoes in a wide variety of bright suede options and metallic leathers. What’s so good about a driving shoe moccasin? In a nutshell, men's driving moccasins are comfortable to wear whilst driving thanks to their careful design. A normal shoe would become worn down due to the contact with the floor at the incline, which is why driving moccasins are different. However, don’t be fooled into think they’re specialist shoes for driving & racing. Motorsport driving shoes are a completely different type of footwear. Driving moccasins are for everyday wear. And UK residents be careful! You can receive a fine of up to five thousand pounds and nine points on your licence if you are caught driving with improper footwear. So, even more reason to invest in a good driving shoe! Our driving moccasins feature a full grain calf leather removable padded insole with arch support, for instant comfort. They are a standard fit, so do not need to be ‘broken in’ like a conventional cemented or Goodyear welted shoe. You should also note that by the nature of their construction, all moccasins fit tighter when new and tend to give about half a size in fit over time. Therefore, I would recommend always going for the tighter fit when new, rather than choosing a fit that is too loose. I have been wearing driving shoe moccasins for many years now, not only for driving but for everyday domestic use. They are easy to slip on and off, and I have several pairs to co-ordinate with my clothing choices. The manufacturers recommend that with most high-quality shoes, one should alternate them and not wear the same pair on consecutive days. There are very few disadvantages to wearing a men's driving moccasin. However, if pressed to find one, you should note that they're not waterproof. Also, unlike some other men's designer shoes, they can wear out a little more quickly if worn too often or in the wrong environment. While men's driving moccasins fit 80% of the population, the other 20% will struggle with this shoe because of its lack of adjustability. If you have a skinny foot or a high instep, you won’t fit in ‘off the shelf’ driving shoes. Your only choice is to go to a bespoke cobbler. More of that below in the “how to choose the right size” section of this article. Technically, it is possible to manufacture moccasin lace up shoes and even moccasin boots, but they’re a lot less common. What to wear a moccasin with and when? Fashion over the years has dictated that a formal Goodyear welted shoe should be the standard attire for most occasions. However, times are changing. I have noticed that brighter colours are emerging in the modern day. This is what makes driving moccasins so timeless. Stylists can easily adapt them to modern styles, colours, and trends. Suede driving moccasins are the natural choice with jeans. During warmer seasons you can wear moccasins without socks with a pair of shorts or beach wear. Who makes the best men's driving shoes? With lifelong ties to Italy, I have followed the development and history of Italian driving shoes very closely. In my opinion, Italian moccasins are some of the very best in the world. They are extremely comfortable, stylish, and made from the highest quality materials. There is so much hidden away in the making of a moccasin. For example when the first rubber dotted soles were produced, they used soft rubber dots that were prone to breaking off. However, the latest thermoplastic polymer ingredients make the sole more durable. So, the Italian soles are superior and much better than even twenty years ago. How do Moccasin retain their shape? Modern moccasin factories use hot and cold aluminium lasts to remove the creases around the apron. This gives the moccasin uppers their perfect shape by inducing a kind of memory effect. When leather is heated, it shrinks slightly and pulls tight against the heated aluminium lasts. Once removed and quickly cooled, it cleverly remembers this shape. The same is true for the thermoplastic stiffeners in the back of the moccasin, located between the lining and upper. They are moulded to last at this higher temperature and set when cooled. This process gives it a pinched clip at the back to hold onto the foot. The soft full-grain and suede leathers produced by Italian tanneries are fantastic, and world famous. They also continuously offer new and more subtle colours. Watch out for the new ladies pastel lilac shade that Arthur Knight will be launching. I think its going to look sensational! How to choose the right size for your driving shoe moccasins? As already touched on, driving shoes are essentially unstructured, so they will give and adapt to most people’s feet. They can give up to three millimetres, equivalent to half a size. Also, driving shoes have no elastic gusset or functional laces. This means they won’t always fit a person with a very high instep. Like all slip-on non-gusset footwear, there is a compromise between the ease of putting the moccasin on, while retaining good shape. Italian moccasins have optimised this finely balanced problem. The length of the moccasin apron has been determined by trial and error over many years. For purposes of longevity, it is important you understand how to look after a moccasin. If they have metallic uppers or are soft full-grain tumbled leathers, then it's best to wipe way any mud or dirt with a damp cloth. You can then lightly apply a transparent or self-coloured shoe cream. Be careful not to spread to much polish on the under surface of the moccasin as this might stain any carpets of soft furnishing. For suede and nubuck finishes, do not apply any shoe cream or polish. It's best just to wipe any mud or dirt with a damp cloth. After this, allow them to dry and then brush lightly with a metal brush. That will give the suede its natural ‘nap’ back - the nap being the way suede becomes lighter or darker depending on how you look at it. Driving shoes are simply fantastic! When wearing them, you’ll ooze a sort of sophisticated Italian style & flair that your friends & peers are bound to notice. Arthur Knight men’s driving shoes are all 100% made in Italy in the famous ‘Marche’ region. They have featured in publications including GQ™ and Esquire™. Whether you’re new to driving shoes, or like me a die-hard moccasin lover, be sure to check out our full collection here.